Similar to studying a new language, learning to play any instrument requires the analysis of existing vocabulary to express and develop your own ideas. For less than the cost of a private lesson, you can start building a library of customized transcriptions featuring your favorite bass lines and solos. Since 1993, I have transcribed hundreds of complete compositions and excerpted parts of music at every level from the basic 8th-note rock of Blink-182 to extremely technical solo bass performances recorded in altered tunings by Michael Manring. Even though I specialize in transcribing and arranging music for bass guitar and acoustic upright bass, I have also transcribed saxophone, trumpet, piano, and guitar parts. 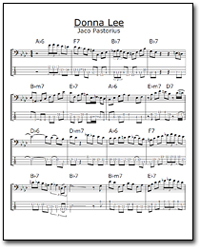 From basic jazz chord charts and lead sheets to big band arrangements and full orchestral scores, I transcribe all styles of traditional and contemporary music including jazz, fusion, funk, rock, pop, blues, classical, motown, latin, and country. All transcriptions are created in standard music notation (and tablature when requested) using Finale, the world's best-selling music notation software for creating, editing, and printing sheet music. Along with standard notation and tablature, transcriptions may contain chord symbols, articulation markings, tempo indicators, rehearsal letters, special signs, dynamics, vocal lines, terms, and extended performance notes upon request. The rate for transcribing is $25 per hour, and the price of each transcription varies depending on the complexity of the music. The turnaround time for most transcriptions is less than week, but more difficult tracks may require more time. In addition to transcribing music from audio tracks and video media, I can create publication quality sheet music from handwritten manuscript on traditional staff paper. I can also provide you with slower versions of the original audio track which you can use for practicing passages until you can play the music note-for-note up to tempo. Upon completion, all transcriptions are delivered via e-mail as a PDF file which can then be viewed and printed using the free Adobe Reader. To receive a free price quote, send an MP3 file of the music along with a detailed description of the parts you are seeking to have transcribed to: InstituteOfBass@Yahoo.com. Please be sure that any single audio file doesn't exceed 20 MB in size. New projects are accepted on a limited basis as my schedule permits.